Deem Facebook Messenger is a mission-achieving, right-when-you-need-it problem solving chatbot assistant built seamlessly into the Facebook Messenger platform. 1.2 billion people use Facebook Messenger every month. 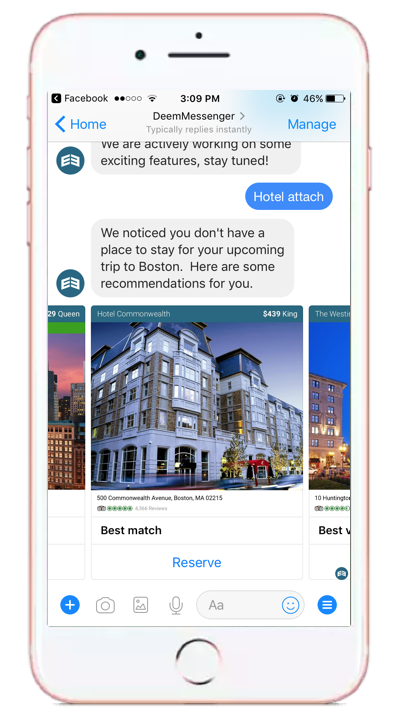 Once a traveler connects their Deem account to Facebook Messenger they can take their personal, always-on travel assistant with them everywhere they go. Travelers own their itinerary from looking to booking, to stepping off the jet way, to arriving at their hotel. Deem’s Facebook Messenger capabilities allow travelers to master travel disruptions, stay on track with trip reservations and plan for whatever comes next. All the functionality of Messenger, including speech recognition, automatic geolocation services for duty of care, mobile and desktop support are integrated and include company policies, preferred suppliers and negotiated rates. Hotel Intelligent Attach is an artificial intelligence, machine learning platform that processes millions of data points including hotel reviews, traveler preferences and company policy to recommend customized and optimized hotel options for each individual traveler and their trip. Hotel Intelligent Attach helps your travelers book better hotels, faster – and all while maintaining company compliance and saving costs. Deem Facebook Messenger is free. Once you turn it on and employees connect their profile, they have access to the growing list of features and functionality.